Oasis Backpackers' Palace Sevilla, Sewilla, Hiszpania : Rezerwuj teraz! Cancellations need to be done by email and confirmed by us. Cancellations done through the telephone wont be accepted. Cancellations done 45 days before arrival wont be penalised. Cancelations done 45 days before arrival will be penalised with a 30% of total amount. Cancellations done less than 15 days before arrival will be penalised by a 100% of the total amount. Group size alteration to your reservation will be free of charge until 1 month prior to arrival. After that, changes are not possible. No shows i.e. not arriving at the hostel will be penalised by a 100% of the total amount. 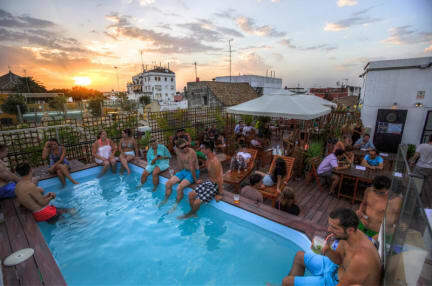 Oasis Backpacker&#39; Palace Seville reserves the right to charge an extra deposit for group bookings whenever it seems appropriate to the company. Our hostel comes with free bed linen, blankets and security lockers, as well as Wifi in all rooms and computers with internet access. A key deposit will be needed for your key access cards. Towels may be rented at reception for 1. Check-in begins at midday and you may check in until midnight. Breakfast (not included) is from 8am to 11am. Should you need other breakfast times, please inquire at groups@hostelsoasis.com. Same for lunches and dinners. Check-out time is at 11.30am, late check-outs will result in loss of key deposit. All guests will behave with respect towards other clients and hostel staff and will be responsible of their own acts during the stay on our premises. If the guests don&#39;t wish to share a dorm with anyone, they will have to pay tall unoccupied beds in that dorm or book a private room. Oasis Backpackers&#39; Palace Seville reserve the right to refuse admission or to end a stay at our own discretion. Ask for special conditions for your group, we will accept exceptions to the cancellation policy under occupancy. Przetłumaczone przez Oasis Backpackers 'Palace Sevilla jest tętniący życiem hostel znajduje się w centrum miasta, w pobliżu El Corte Ingles i Plaza de Armas. Hostel ten oferuje taras na dachu z basenem i bezpłatne piesze wycieczki, jak i językowych, tanecznych i gotowania lekcji. Istnieje również wiele popularnych działań, takich jak indeksowaniami tapas degustacje i pubów. Lubimy, że hostel ten oferuje szeroki wybór pokoi prywatnych, apartamentach i pokojach wieloosobowych, wszystkie z łazienkami. El Corte Ingles. Na dachu hostelu znajduje sie taras, bar I basen, cos w sam raz na upalne lato w Sevilli. I spent only one night there, but seemed like a place where I could stay much longer. No complaints, fully recommend.